a versatile addition to baking tools, kitchen gadgets, and bar tools. Crafted from Japanese stainless steel with a BPA-free, easy-grip handle for comfortable use. Fresh ingredients are tastiest when prepared immediately before use. Zest citrus rinds, like oranges, lemons and limes, and finely grate hard and semi-hard cheeses, blocks of baking chocolate, and other firm ingredients. Easily create decorative garnish to finish desserts and baked goods, hot chocolate, coffee beverages and craft cocktails. Stow a spare in portable coolers and tailgating supplies. Made from Japanese stainless steel, HIC’s Zester stays sharp and resists rust. It’s easy to use and compact for easy storage. Use a gentle brush to dislodge any food bits. Dishwasher safe for easy cleanup. 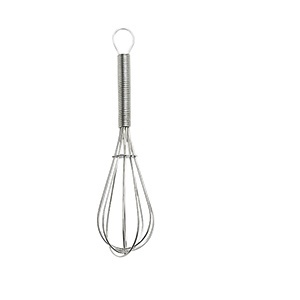 Mrs. Anderson’s Mini Whisk 6 Inch.